The Brooklyn Bridge was built between 1869 and 1883 and was opened in May 1883. It was the first bridge in the world to be suspended by steel. For a while, the Brooklyn Bridge was the only connection between Manhattan and Brooklyn. If you walk over the bridge from Brooklyn to Manhattan, you’ll have a wonderful view of the skyline of New York. The Brooklyn Bridge was designed by John August Roebling who died as a result of an accident during the construction of the bridge before it was completed. After his death his son, Washington Roebling, took over. He too had an accident, which made it impossible for him to coordinate the construction of the bridge. He continued to follow the construction of the bridge from his apartment with a telescope and was assisted by his wife Emily Warren Roebling. She helped with the communication between Washington Roebling and the construction workers. During construction, tragically 27 other people died. 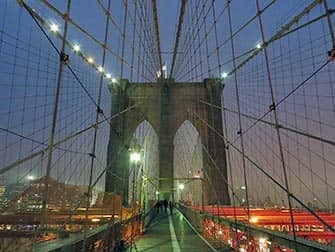 On May 24th, 1883, the Brooklyn Bridge was officially opened. Emily Warren Roebling was the first to cross the bridge, and 1,800 vehicles and 150,300 pedestrians followed her that day. 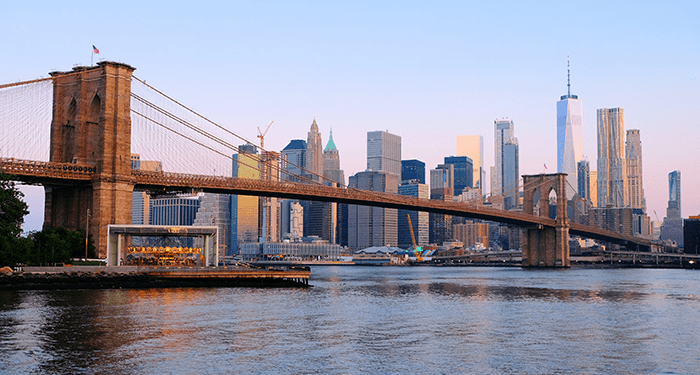 At that time, the Brooklyn Bridge was the only connection between Manhattan and Brooklyn. When the Brooklyn Bridge was built it cost $ 19 million. In 2007 this amount was equivalent to $320 million. Fun fact: Six days after the opening rumours arose about the stability of the bridge, it was said that it would collapse. To prove the rumours wrong, circus man P.T. Barnum paraded 21 elephants over the bridge the following year. 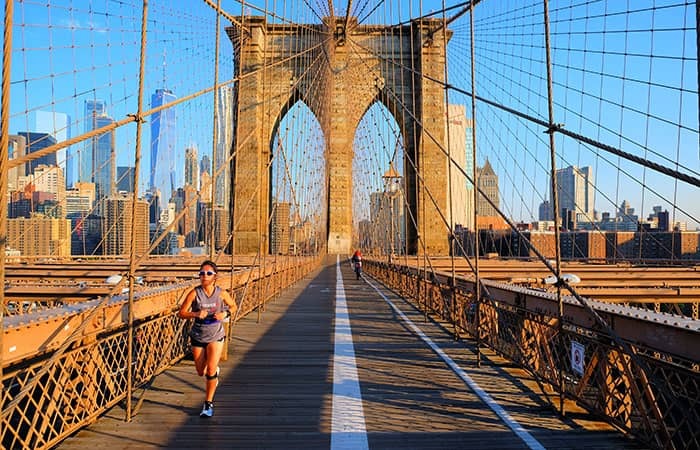 Nowadays an average of 120,000 cars, 4,000 pedestrians and 2,600 cyclists cross the Brooklyn Bridge every day. The Brooklyn Bridge has evolved over the years to become both an attraction and symbol of New York. The best way to see the Brooklyn Bridge is on foot. It is best to walk across the Brooklyn Bridge to Manhattan so you can enjoy the view of the New York skyline. An advantage of this is also that the bridge is slightly sloped in this direction. This takes approximately 45 minutes but allow for more time as you will want to take photos. Take metro line A or C to High St. in Brooklyn. From here you can follow the signs for “Brooklyn Bridge”. The entrance to the bridge is on Washington Street. Another great way to explore the bridge is by renting a bike and cycling over it. 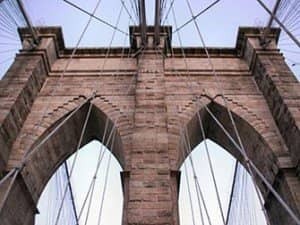 If you’d rather go on a guided tour and learn about the history of the Brooklyn Bridge while you cross the bridge, read more here. When you want to visit the Brooklyn Bridge and Brooklyn Bridge Park, the following walking route is really nice. Start by taking the subway to High Street – Brooklyn Bridge Station. When you arrive here, walk towards the water, along Middagh Street. At the end of this street, go right on Columbia Heights and at the end turn left. You’ll find Brooklyn Bridge Park straight ahead. 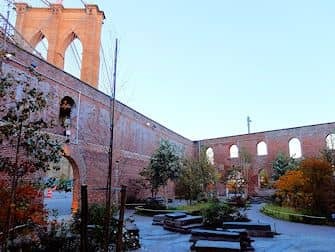 After, you can either walk to the entrance of the Brooklyn Bridge, or stay in the park and head towards Jane’s Carousel. Here, you are also close to Washington Street, where you can take your own iconic photo of the Manhattan Bridge with the Empire State Building in the background. Then continue all the way along Washington Street, which ends at the Brooklyn Bridge Walkway Entrance. The name ‘Brooklyn’ comes from the Dutch town Breukelen. Brooklyn is one of the most relaxing areas in New York. It is also one of the most multicultural areas of ​​the city. Every culture has its own little neighbourhood in Brooklyn. In Brooklyn, you can enjoy an ice cream at The Brooklyn Ice Cream Factory next to the bridge. Enjoy the view of the Brooklyn Bridge, the Manhattan skyline and the Statue of Liberty at the establishment on the Fulton Ferry Pier. Of course you can also drink a milkshake or have a cup of coffee. There is also an establishment on 97 Commercial Street near Manhattan Avenue. Are you really hungry or simply want to eat good pizza? Go to Juliana’s on 19 Old Fulton Street. If you only want a drink, you’ll find many bars in Brooklyn. The Brooklyn Bridge Park is an ideal place for you to take a break from the hustle and bustle of Manhattan. You can also go sunbathing or swimming, if the weather permits, at the swimming pool. The Pop-Up Pool can be found between Pier 1 and 2 in Brooklyn Bridge Park. Eric’s Tip: If you don’t want to do too much walking, choose to take the NYC Ferry over the water. It only takes a couple of minutes to get from Manhattan to Pier 1 in Brooklyn Bridge Park. On the way you have a great view of the skyline and the Brooklyn Bridge.